What will the just economy of the future look like? We asked for your suggestions for cities across North America that are living examples of fair trade values in action. Is yours on the list? Minneapolis-St. Paul is a hotbed of fair trade activity. For decades now, local nonprofits like the Institute for Agriculture and Trade Policy and the Minnesota Fair Trade Coalition have been fighting for more just food and trade policies. 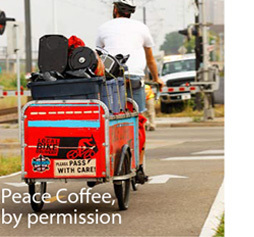 Fair trade coffee is plentiful thanks to local fair trade coffee roaster Peace Coffee (their bike delivery program does its part to green the just economy as well!). Fair trade pioneer Equal Exchange has a regional office in town too, and there are smaller fair trade stores like Ten Thousand Villages and Regla del Oro for all your needs! Burlington, Vermont supports its crunchy college-town reputation with longtime fair trade activism. The Peace & Justice Center has programs in Fair Trade Education, Racial Justice, and Peacework, and over the years they have been the catalyst bringing fair trade policies to local colleges and universities. Local City Market Co-op is the source for all things fair trade, and you don’t have to travel far to find fair trade coffee from dedicated companies like Vermont Coffee Company and Vermont Artisan Coffee. Add a stop at Ben and Jerry’s, which has progressive wage policies and a history of activism on trade issues, and your journey is complete! 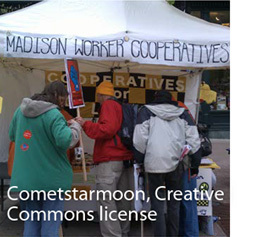 Madison, Wisconsin is a hub of fair trade in the upper Midwest. Want to stock your house with all things fair trade? Stop by SERRV, one of the oldest fair trade organizations in the country. Time to refuel? Countless local coffee shops would be happy to serve up some fair trade coffee, possibly biked there by hometown hero, Just Coffee Co-op. 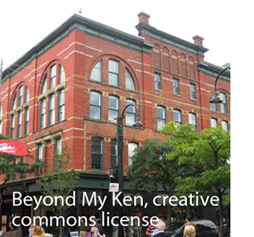 It’s possible to get just about everything via a cooperative. In addition to the venerable Willy Street Co-op grocery, there’s a co-op bakery, taxi company, and more—even an engineering firm (check out Isthmus Engineering for a new take on tech). The University of Wisconsin brings study and activism together, with students studying fair trade issues all the way to the doctoral level, and a Center for Cooperatives that supports those looking to make a just economy a reality. Takoma Park, Maryland has a long history as a community of activists. Sometimes called “The People’s Republic of Takoma Park,” this city takes its municipal government seriously, broadening its definition of eligible voters, and declaring its city one of the first nuclear-free zones in the country. Organizations like FairVote and CASA de Maryland work to secure basic rights and democracy for all people. 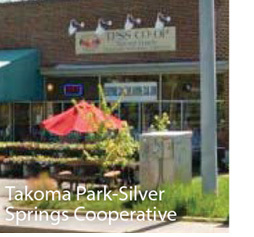 At the heart of town, Takoma Park Silver Spring Co-op provides ready access to fair trade foods, and Fair Day’s Play has the fun and games all covered. Montreal is known as a charming cosmopolitan city, and that includes plenty of fair trade options. With Montreal host to the World Social Forum in 2016, fair traders won’t have to travel far. 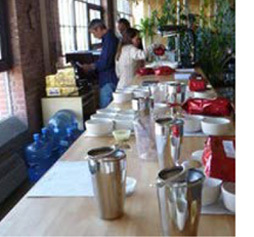 Cooperatively owned fair trade coffee importer Cooperative Coffees has a hub in the city, and you can find beans all over town from committed companies like Santropol and Café Rico. Organizations like Equiterre are working toward a sustainable and fair future for all. And if that’s not enough, students at McGill University marked their designation as a fair trade campus by baking the world’s largest brownie—4,000 pounds with all fair trade ingredients! Los Angeles is making strides towards fairness across its massive economy. 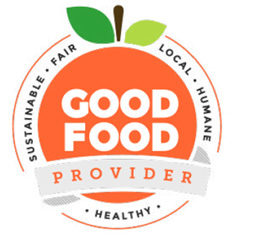 The Los Angeles Unified School District and the City of L.A. have recently adopted the Good Food Purchasing Policy committing to five fundamental values in sourcing the 750,000 meals they serve daily. Those five values— building a strong local food economy, environmental sustainability, a valued food industry workforce, humane treatment of animals, and high nutritional quality—stretch the definition of fair trade to encompass a holistic vision of a more just food system, and provide a model for other cities. Los Angeles also has the largest concentration of manufacturing jobs in the U.S. Long synonymous with sweatshops, groups like the Garment Worker Center are fighting for change by organizing and empowering the low-wage workers who dominate the garment industry. If you want to get more involved in building a just economy, see if your town is involved in a Fair Trade Towns campaign. Although the focus is primarily on fair trade purchases, there is room to engage in policy issues and broader activism within the program.